As you can see from the federal standards, there is a very low limit for most of these, with many in the parts per billion (ppb) range. 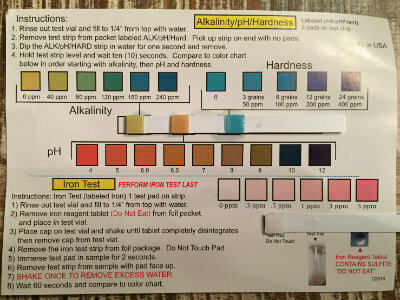 The complete water testing kit is precise enough to identify at these low levels, and many of the tests quantify your results, which is even better. Quantified results allow you to determine how much over a limit your water source is. Besides using the water testing kit to test your water source immediately, it also makes sense to have stored in a disaster kit. In many disaster scenarios water sources become contaminated and undrinkable. Having a kit handy can help you confirm the drink-ability of your water. A few disasters that could cause municipal or well water problems include hurricanes, earthquakes, and most of all- flooding. This section of the complete kit is the most relevant given the not-to-distant Flint, MI fiasco. This part is easy and quick to run. You fill the vial with water from your source, dip the strips for 10 minutes, and then check them like you would a pregnancy test. It is unlike the other strip tests in the kit, in that the strip just shows a positive or negative result. The stripes are set to be darker on the right than the left when the safe threshold is passed. The strips shown below had negative results, with the left stripe being darker on both, although it was easier to see on one. 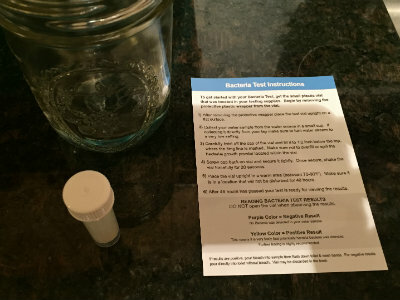 The bacteria kit takes the most time to run and get results, yet it is the most simple of the tests to do. We started this test first, and it only takes a minute or two to get it out of the packaging and set up to wait for results. The vial has a powder in it that creates a bacteria culture in it after a few days if your water sample has bacteria present. It has very simple results. Purple = no bacteria, Yellow = bacteria. 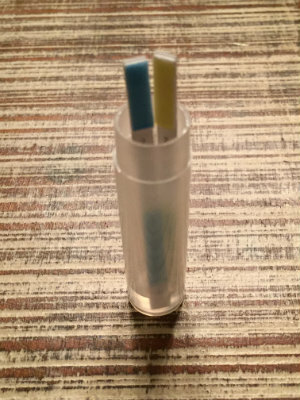 This part of the testing kit contains many different testing strips. The strips have different tabs on them based on what they are testing, and the tabs turn different shades based on the amount found in the sample. This is great, because it does not just give you a good or bad result- it quantifies the result which could tell you how bad a problem is. Opening the foil strips on the side that says “open here” is important so you don’t contaminate the tabs by grabbing them. 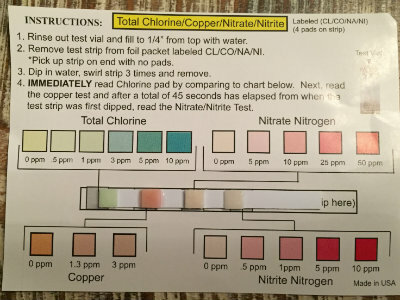 The results seem complicated at first, but you just lay the completed strip on the card and it points to the areas the tabs are testing for on the card. As you can see on my results, sometimes your color may not match one on the card exactly, but you can figure the range for it. 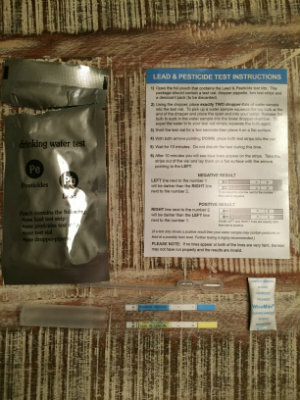 During my time in the Air Force, I used countless biological warfare agent testing “hand held assays.” This kit reminded me a lot of those assay kits, since the step by step instructions are important yet easy to follow. Our biological warfare testing kits were meant for field testing, and true results were achieved by testing lab samples. 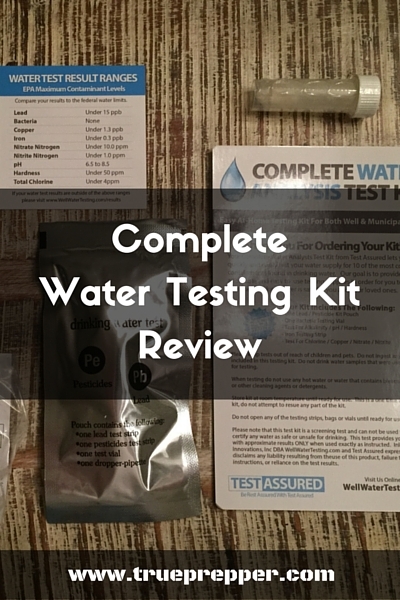 This complete water testing kit serves a similar purpose- it is great for quickly testing but not 100% accurate or comprehensive. No field test will be that accurate, and if you are concerned about the accuracy, you can simply run multiple kits at once. 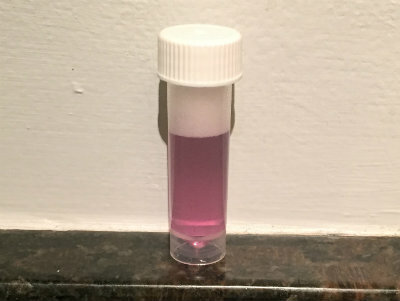 It was procedure to run two hand held assays with different lot numbers when testing for biological agents to limit false positives, and you could do the same with water testing kits for better sample confirmation. The kits are lightweight, small, and cheap enough to stock up on. User error would be the main reason one of these kits fails to perform. There are many instructions included with the kit, and every step seems equally important to avoid contaminating samples and testing strips. That given, it is possible the some lots may show false positives, but running multiples tests would lower that chance. 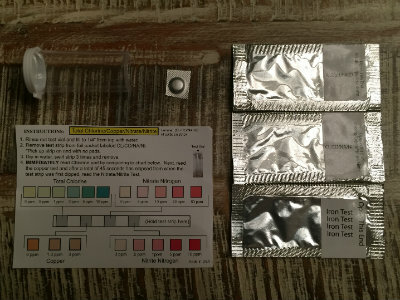 The chance of a false positive is very low anyways on these kits, and the result would probably be from user contamination. There are more accurate tests that exist, such as lab tests, but not at this size, speed, or cost. 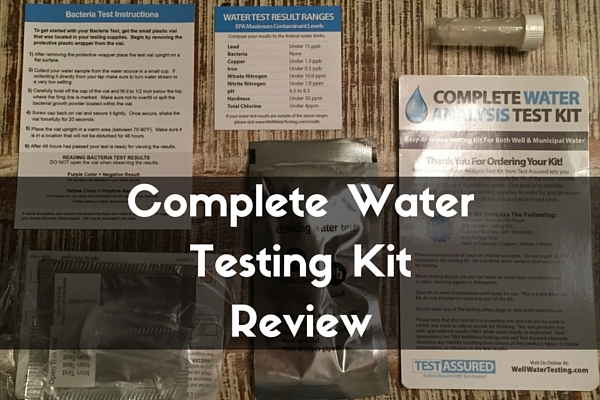 At TruePrepper we recommend the Complete Water Testing Kit as an addition to your disaster kit. You may want to pick up two of these- one for emergency use, and one to use ASAP to ensure your water does not have currently have any contaminants. The kit is small and lightweight, so it is easily added to most disaster kits. Reading the instructions on this kit is very important to avoid faulty tests, so read them every time- even if you have run the tests before. 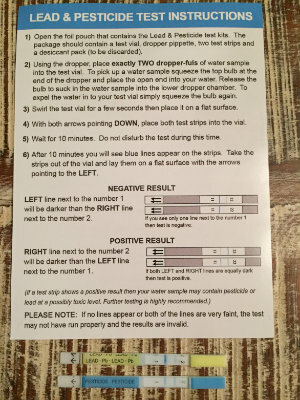 WaterTestingKits.com provided TruePrepper with a Complete Water Testing Kit at no cost so we could conduct our review. Our disclosure statement is here, and on the bottom of every page.